Eating healthy on the go shouldn't be a challenge. Every weekend I spend time prepping for my lunches for the week so I have something healthy and easy to grab in the morning on my way out the door for work. Sometimes the husband will take one of my prepped lunches and will completely throw off my week. Last week he did that, twice. I was not impressed. 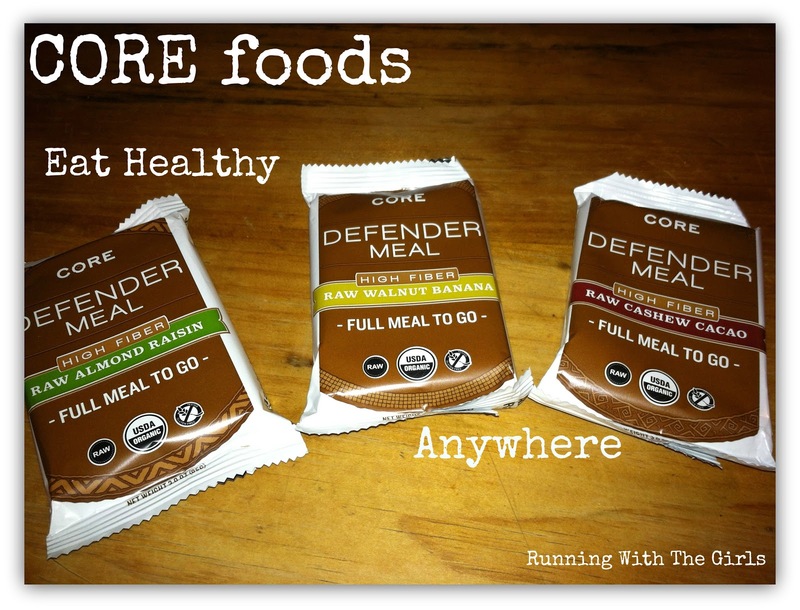 But then these delicious meals made by CORE foods came in the mail, so what could have been an issue was no longer. Initially, I thought, "no way are these bars, that are the size of my hand, are going to fill me up." So on the first day, I brought additional snacks with me "just in case". I am pleased to let you know that I didn't reach for one of those additional snacks. I felt completely satisfied eating the CORE Defender Meal for my lunch. If you pay attention to calories, the Defender Meals were 350 calories and 400 calories. Most of my Sunday prepped meals are around the 400 calorie mark, sometimes a little more. So there wasn't much of a difference there at all. In terms of the taste, these bars were not sweet at all. Which I liked. Something about eating something sweet for a meal just doesn't seem right to me. Essentially, the meals were like eating a large oatmeal bar. I liked that the directions said to drink two glasses of water afterwards as well. Which is never a problem for me, as I drink water all day long. I'm kind of sad I ate all three meals already. I would love to have more of these in the refrigerator or freezer to just grab for road trips or when I don't have a lunch for school. They taste good and are very good for you, so why not? I'd say it's a no brainer for sure. CORE foods makes fresh, portable food. They are 100% vegan, gluten free and raw. 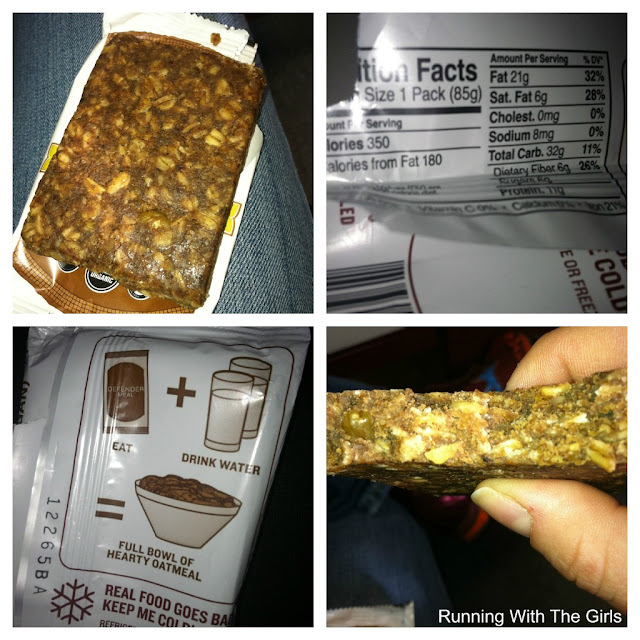 CORE foods ingredients: whole oats, nuts, raisins, flax, and spices. Defender meals are perishable. They last 6 months when frozen, 1 month when refrigerated, and 1 week on the go. They thaw quickly - only takes about 10 minutes from the time you take it out of the freezer. If you would like to get $5 off your online order for COREfoods, go to their facebook page here and then enter for your chance to win a free case (worth $40). Disclaimer: I was sent three Defender Meals for the purpose of a review and was not compensated. All opinions expressed here are 100% my own. Thanks for the review. It's always really nice to hear about new products like this. I never think a bar is going to fill me up either so it's really good to know that this one does. I don't usually try to sub meals with a bar, but man sometimes they come in handy! They look good! I also don't substitute a meal with a bar, but in a pinch when I don't have anything for lunch these would be a great option.